Plug n' Dike is a non-toxic material, which forms an immediate seal to control flammable and/or hazardous leaks and spills. Sticks to dirty, rusty, greasy surfaces. All of our Plug n' Dike products are premixed with antifreeze. It has been used for over 20 years by fire departments, transportation companies and industrial operations. Simply take a handful of premix and apply directly over the leak. 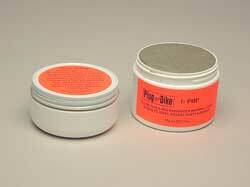 Plug n' Dike / Leak Repair Putty makes a great addition to any Spill Response Kit. Please contact us for further information and pricing on Plug n' Dike products.